In Hamilton, many homes have issues with mold, particularly in basements. This occurs because moisture permeates through the foundation, resulting in damp floors. One way to reduce the likelihood of moisture building in your floor and ruining the structural integrity of your home is to insulate the underside of concrete floors with steel or fiberglass panels containing polyurethane foam. Our product, Insta-Panels, helps to prevent dampness and mold growth, thus ensuring a healthy home. Because the insulation is positioned underneath the concrete, the slab will remain condensation free. If these panels are exposed to moisture or other damage-causing elements before or during installation, there is no need to worry. Insta-Panels will not lose R-value, thereby ensuring the longevity of the product. To learn more about our Insta-Panels, call us at 1-855-561-4279. 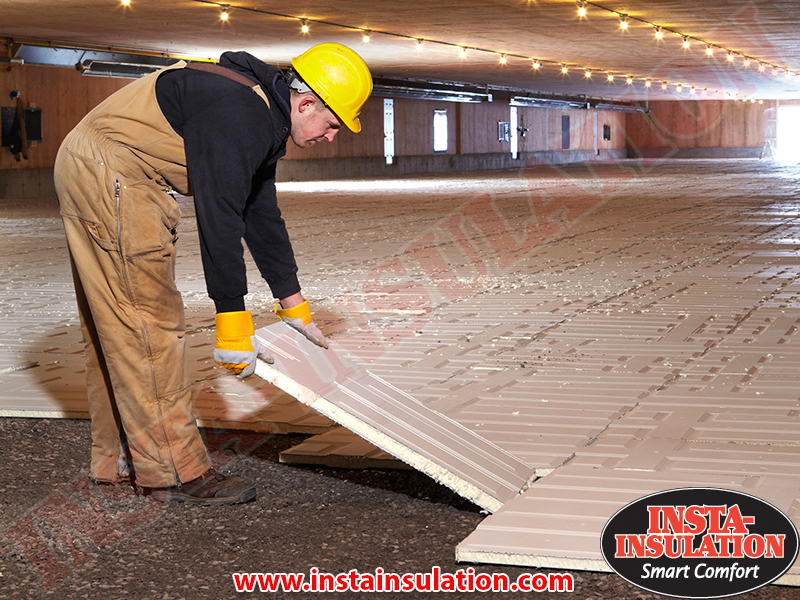 In addition to Insta-Panels, Insta-Insulation offers several other insulation services in the Hamilton region. Insta-Insulation has over 25 years of experience with installing, upgrading, and removing home insulation. For installing and upgrading attic insulation, we offer blown-in cellulose and spray foam services. Where insulation must be removed for whatever reason, such as mold growth or asbestos-riddled vermiculite, the safety and health of your family is of the utmost priority. There are many ways to insulate a home attic, and some are more effective than others. A new approach is called the hot roof system. With this, medium density spray foam is applied directly onto the entire underside the roof, completely blocking summer heat from finding its way inside. A sealant and insulator, spray foam also eliminates the need for attic deck insulation or air sealing. A not so modern insulation method for older homes is tightening the attic deck. At Insta-Insulation, we will not use a can of spray foam or a polyurethane kit after repositioning batt insulation. Instead, we will thoroughly remove all existing attic insulation, install new soffit baffles, and stuff the top plate before we insulate. Depending on the structure, we will either install a layer of spray foam insulation onto the full surface area of the attic deck or onto the backside of plaster or drywall. Following this, cellulose fiber will be blown on top of the initial layer of spray foam. Like installing insulation for the first time in a home, upgrading a home attic insulation level has its considerations which must be addressed. At Insta-Insulation, our trained consultants will check to see if several key components, such as wiring and ventilation, are in working order prior to the upgrade. If your home has a low slope attic, our consultants will not provide the blown insulation service unless we are 100% sure the attic can be vented properly. We will not risk mold and mildew growth in your home. We recommend blown cellulose insulation for attics because of its exceptional coverage and performance, and the system we use is Climatizer Plus. You might think that cellulose is susceptible to mold because it absorbs water; however, cellulose insulation has the capacity to dry itself when exposed to moisture. As such, this system helps to reduce moisture levels in your attic. In addition to this, the system contains a flame retardant, which does more than control fire. It prevents mold from forming and deters wildlife from nesting in your attic. Traditional insulation methods, like fiberglass, have a difficult time reaching nooks and crannies. Spray foam doesn’t have this problem. Spray foam also surpasses traditional methods in terms of R-value and air control. Because spray foam is a high performance insulation, you can expect superior protection against thermal bridging and energy loss. By 2020, all spray foams are required to abide by strict environmental regulations stipulated by the government. The spray foam we use at Insta-Insulation already follows these new rules. There are scenarios in which the existing insulation in a home may need to be removed. The most common reasons to have insulation removed include but are not limited to animal infestation, structural or electrical renovation, and water or smoke damage. In addition to these reasons, you would need to have your existing insulation removed if it were contaminated with mold, which can lead to health problems. Another health and safety-related reason to remove insulation is if it is composed of vermiculite that contains asbestos. If you have vermiculite insulation in your home, and it does contain asbestos fibers, do not attempt to remove it yourself. Removing insulation contaminated with asbestos must be done by well-trained professionals with the proper equipment. At Insta-Insulation, we will remove insulation for any of the above-mentioned reasons; however, please be aware, we will only remove vermiculite insulation if the percentage of asbestos is equal to or below .5%. Otherwise, we will refer you to a remedial service. Mold in the home attic is a serious issue. Unfortunately, many home owners neglect to add attic inspections to their spring cleaning routine, and because of this, mold isn’t detected until it has spread. If you do inspect your attic and notice mold, immediate attention is required. When it comes to mold removal, Insta-Insulation works in conjunction with a mold remediation company. Within three to four days, the contaminated insulation will be completely removed from your attic space. During this process, we do more than remove the visible mold and re-insulate. We take the necessary steps to ensure it doesn’t come back with an even greater vengeance. Insta-Panels will do more than keep your home comfortable all year long. These insulated panels for concrete floors help to reduce the strain on your wallet, especially in relation to repair and maintenance costs. After all, these panels are so durable you could drive a concrete wagon over them and still not inflict any damage. Moreover, the moisture-resistant properties of these panels are top notch. Yes, you can leave them outdoors prior to installation and its R-value will not lessen. In relation to R-value, these polyurethane foam panels covered in either steel or fiberglass offer higher resistance to heat loss compared to competing insulation products made of expanded polystyrene or extruded foam boards. If you are interested in expanding your living space while improving the overall health of your home, Insta-Panels is a great choice. Need a place to store your outdoor, seasonal toys when they are not in use? Insta-Sheds, a company under the Insta-Insulation umbrella, constructs fully insulted sheds to keep your equipment safe and dry in the ever-changing climate in Ontario. If contents are protected from condensation, the operational capacity of your summer toys will not die before its time, and unsightly rust will not destroy paint jobs. Keeping your summer and winter toys away from the elements, will help you maintain your peace of mind all year long. If you live in the Hamilton region, and would like to learn more about our insulation services, please call us toll free at 1-800-668-0311. You can also contact us by e-mail.